10 super spices and their health benefits. Spices don’t just add another element to your cooking; they’re also good for your health. In fact there’s a reason that people have been using spices for thousands of years. Scientists are now uncovering their vast potential power, from helping ease chronic conditions to the prevention and treatment of more than 150 health problems. Why? Without getting into the complicated science of it (and there’s lots of it if you’re interested) spices have a variety of benefits, including being high in antioxidants, having anti-inflammatory properties and they can even promote weight loss. 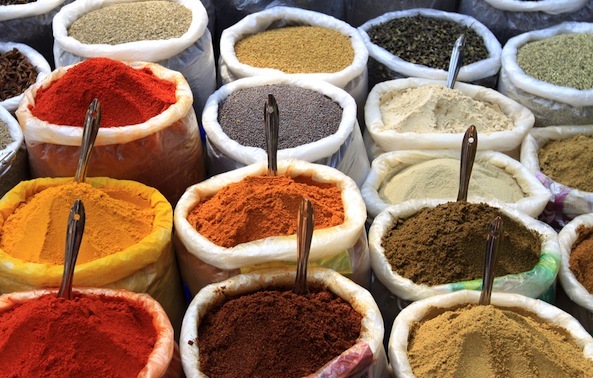 There is a whole world of spices out there to add health benefits to your food. Here’s a list of ten to start with. Why is a chile pepper hot? Capsaicin–the active ingredient that basically makes a chile taste hot is actually quite good for you. It has been shown to inhibit bacterial growth, boost your metabolism, which in turn helps with weight loss, give you more energy and relieve skin allergies. An Australian study found that adding chiles to meals may protect against the buildup of cholesterol in the blood. So, don’t be afraid of increasing your spice tolerance. Turmeric’s claim to fame is curcumin, an antioxidant that some studies have shown to help reduce the risk of heart failure and inhibit the growth of cancer cells. It’s also an incredible anti-inflammatory, and can even be used in the place of ibuprofen – good for people dealing with long term chronic pain and wanting to limit their drug intake. If you are going that route, be sure to look for turmeric extract, sold in tablets or capsules and note that the effects are not felt immediately. Add the spice (or fresh root if you can find it) into stir fries and lentil dishes, or anything that needs a little color. Well-known in Indian cooking, and the beloved spice of Scandinavian baked goods, cardamom contains limonene, a chemical that has been shown to boost antioxidant activity. It has also been shown to help with lowering blood pressure and improves digestion. It also has alkaline properties, and in the Middle East, coffee is often made with cardamom, reducing the coffee’s acidity and neutralizing the effects of the caffeine. Helping to balance blood sugar, cinnamon is helpful for those with dealing with type 2 Diabetes. In fact, in a Swedish study (albeit small) where subjects ate a bowl of rice pudding–half of them with cinnamon added, half without–those who ate the cinnamon version ended up with significantly lower blood sugar levels. Given that cinnamon works well in sweet and savory dishes, there’s no end to how it can be used. Ginger is another anti-inflammatory, and it’s also ideal for calming an uneasy stomach. It’s also full of antioxidants; one teaspoon of ground ginger has as many antioxidants as a cup of spinach. While adding ground ginger to your morning bowl of granola and sprinkling onto dishes is good, it’s also worth buying fresh ginger root, which has a little more of a kick to it. A few pieces of crystallized ginger can be good for dealing with motion sickness, and for a morning spike of energy, I like adding it to green smoothies. Plagued by menstrual cramps every month? With its phytochemicals and phytoestrogens, fennel can help offset cramps. Get the benefits from fennel seeds by grinding them and steeping with tea. With its licorice-like flavor, fennel seeds are also good in fruit salad and with grilled meats and seafood. You may use it just as a decorative garnish, but researches at the University of Missouri found that parsley can actually inhibit breast cancer cell growth. Parsley is also rich in vital vitamins including C, B12, K and A, which means it keeps your immune system strong. Add it into soups and salads, or mix with fresh fruit for a delicious smoothie. If you’re a garlic lover, you’ll be happy to know that it’s known to lower blood pressure, bring down levels of cholesterol and helps alleviate allergies. As it has been shown to destroy cancer cells, even one or two cloves a week can even provide cancer-preventative benefits. Contrary to popular belief, coriander and cilantro are not exactly the same thing. Cilantro is the leafy herb that comes from the coriander plant, while coriander the spice, comes from grinding the seeds. Coriander seeds have been used for thousands of years to help with digestion, and recently it has been found to alleviate symptoms of irritable bowel syndrome. Use it like you would pepper, add to vinaigrettes and dressings, or in meat marinades. Cloves are actually at the top of the list of spices with antioxidant properties, and for more than 2,000 years they have been used in traditional Chinese and Indian medicine. The essential oils in cloves have been shown to fight bacteria, fungus and yeast, as well as encouraging healthy gums and teeth. The spice can also help alleviate a cough.